This specific claim relates to the Crown’s non-payment of Treaty 6 annuities to members of the Beardy’s and Okemasis Bands (now known as the “Beardy’s and Okemasis First Nation” or the “BOFN”) between 1885 and 1888 following the North-West Rebellion (the “Annuities Claim”). Treaty annuities claims are somewhat unique in Canadian law with very little by way of existing precedent to guide the process. The Annuities Claim was originally filed with the Specific Claims Branch in 2001 and was rejected for negotiation by Canada in 2008. Because the Annuities Claim was rejected for negotiation, it became eligible for filing with the Specific Claims Tribunal (the “Tribunal”) when it opened in spring 2011. The Annuities Claim was filed with the Tribunal on July 11, 2011 – marking the second claim ever filed with the Tribunal, and the first to proceed to a hearing. The Annuities Claim proceeded before the Tribunal in two phases: (1) the liability phase, where the issue was whether the Crown was legally liable for the termination of annuity payments; and (2) the compensation phase, where the issue was how the BOFN’s historical losses should be brought forward to today. After a thorough review of the evidence before it in the liability phase, the Tribunal found that the Claimant was unlawfully and unjustifiably punished in relation to the events of the 1885 North-West Rebellion. This decision marks a departure from the way the Canadian public has viewed the role of Indian Bands in that infamous and largely glossed over event in Canadian history. Perhaps equally as significant, the Beardy’s decision on compensation rejected Canada’s flawed position that has repeatedly surfaced in Aboriginal law litigation; that is, that equitable compensation for a breach of fiduciary duty or treaty obligation should be discounted based on how much of money would have been spent or “consumed” by the First Nation had it received the money in the first place. We now have judicial authority denouncing such an approach as being inconsistent with principles of equitable compensation. It is our hope that this guidance and clarity will pave the way for a more rational, expedient, and equitable resolution of specific claims in Canada. On May 6, 2015, the Tribunal released Beardy’s & Okemasis Band # 96 and #97 v Her Majesty the Queen in Right of Canada, 2015 SCTC 3 (the “Liability Decision”). In the Liability Decision, Justice Harry Slade held Canada owed an outstanding legal obligation to the BOFN for the unlawful withholding of annuity payments, totalling $4,250.00. The BOFN’s Annuities Claim proceeded as a test case for 12 other First Nations in Saskatchewan with virtually identical claims against the Crown for the unlawful withholding of treaty annuities in the wake of the North-West Rebellion. … the Tribunal has jurisdiction to determine the Claim of the Beardy’s & Okemasis First Nation on the ground of the failure to provide “lands or other assets under a treaty” (SCTA, sub-section 14(1)(a)). The Tribunal’s discussion of its jurisdiction to hear the claim is in response to the Crown’s arguments that: (i) the loss of treaty payments to the members of the Beardy’s and Okemasis Bands are not losses of the Bands as collectives, but rather losses of the individual members which fall outside of the Tribunal’s adjudicative jurisdiction; and (ii) that the treaty payments in issue are not tangible property, and therefore fall outside of the Tribunal’s adjudicative jurisdiction. Justice Slade rejected both arguments. With respect to the termination of treaty payments to the so-called “rebel” Bands in the wake of the 1885 Rebellion, the Crown sought to justify this conduct on the grounds that: (i) the Bands violated the terms of Treaty 6; (ii) the termination of treaty payments was a lawful exercise of prerogative power; or (iii) that these measures were legal by retroactive operation of the War Measures Act. The Tribunal rejected Canada’s arguments that the Crown’s conduct was excusable as either an exercise of prerogative power, or because of the retroactive effect of the War Measures Act. Ultimately, the Tribunal agreed with the BOFN’s theory of the case, specifically, that the termination of annuity payments was not a lawfully sanctioned reaction to the events of the Rebellion at all, but rather, a calculated series of punitive and regressive policies aimed at breaking the tribal system and subjugating the Cree people in breach of the terms of Treaty 6, and in breach of the Crown’s statutory, fiduciary, and honourable duties. Following the release of the Liability Decision, the Crown made the unusual election not to file for judicial review with the Federal Court of Appeal, and the parties proceeded to the compensation phase. The task before the Tribunal in the compensation phase of the hearing was to determine the amount of compensation payable to the Claimant pursuant to paragraph 20(1)(c) of the Specific Claims Tribunal Act, SC 2008, c 22 [SCTA]. This required the Tribunal to consider the most just way to “bring forward” the $4,250.00 in withheld annuities to its present day value, employing the principles of equitable compensation applied by the courts. The Tribunal acknowledged there was no disagreement that equitable compensation was the appropriate remedy in this case, noting that such a remedy must account for the nature of both the obligation and the breach. Regarding the nature of the obligation, the Tribunal provided the “performance of a treaty promise is a Crown obligation of the highest order,” (para 75) and “[i]n the present matter, the nature of the obligation calls for the most honourable standard of fiduciary conduct,” (para 76). Having set the stage for the analysis, the Tribunal canvassed established principles of equitable compensation. 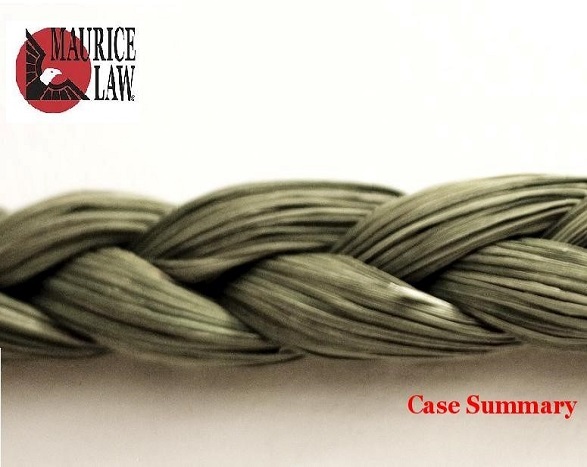 Justice Slade noted the functions of the remedy are to restore the beneficiary to the position they would have been in had the breach not occurred, and to uphold and enforce the fiduciary relationship. To achieve these functions, the Tribunal is afforded discretion in its assessment made as of the time of the trial, as opposed to the time of the breach as in common law. Equitable compensation accounts for both the lost property – in this case, money – and the forgone opportunity to use it. The Tribunal is not required to consider common law principles of remoteness and foreseeability in its assessment, and must consider the factors of most advantageous use and the benefit of hindsight to serve the remedy’s objective of deterrence, subject to realistic contingencies where applicable. Justice Slade clarified the presumption of most advantageous use is not a “rebuttable” presumption, as legal presumptions generally are. In the context of equitable compensation, the defaulting fiduciary need not present evidence of what would have happened with a trust asset that was wrongfully withheld; it does not “make sense” in the assessment of equitable compensation (para 102). The Tribunal confirmed, “[e]quitable compensation includes compound interest to take account of the time value of money,” (para 115). The issue before the Tribunal was at what rate that interest should accrue (para 116). After providing an overview of the parties’ expert reports tendered to assist the Tribunal in selecting an appropriate interest rate, the Tribunal determined the application of the Band Trust Fund (BTF) rate, which is set annually by the government and based on the bond rate, compounded annually, was appropriate in this case. The Tribunal reasoned this rate would most realistically reflect the actual Crown practice in relation to money held for the benefit of First Nations. Further, “the application of the BTF rate as a proxy for interest in equity would reflect a realistic use of the withheld annuities” (para 119). The Tribunal therefore accepted the Claimant’s expert’s assessment of equitable compensation at $4,500,000.00, which the Tribunal said was, “in effect, the equivalent of applying compound interest at the bond rate to the Claimant’s loss of annuities totalling $4,250.00,” (para 120). The Tribunal declined the Claimant’s proposal to award a larger figure to fulfill equitable compensation’s deterrence function because the SCTA precludes the Tribunal from awarding punitive or exemplary damages. The Tribunal held that, unlike punitive and exemplary damages at common law, the consideration of deterrence in equitable compensation “does not take the form of a discrete award,” (para 123). In relation to the application of “realistic contingencies”, the Tribunal accepted our submissions that the Ontario Court of Appeal’s consideration of the concept in Whitefish Lake Band of Indians v Canada (AG), 2007 ONCA 744 was obiter and therefore was not a binding precedent. The Court did not determine equitable compensation in that case, instead sending the matter back to trial due to an insufficient evidentiary record. The parties settled out of court instead of advancing fresh arguments on the assessment of compensation in a new trial. The Tribunal therefore declined to “parse the loss into components of consumption and investment” because it would eliminate the deterrent value of equitable compensation (para 155). Further, the Tribunal distinguished the fact-driven application of the concept of realistic contingencies in Guerin v R,  2 SCR 335, where it was necessary to account for fluctuations in the utility of surrendered land because the highest and best use had changed over time. The Tribunal concluded there was no parallel in the matter before it, given the exercise in the present case was to bring forward the loss of money, considering the factors of highest and best use and the benefit of hindsight. Furthermore, Justice Slade noted Canada did not establish the probability of contingencies that could affect the value of the withheld monies brought forward. In cases where realistic contingencies would apply, as in Guerin, Justice Slade stated their consideration should take place at the end of the analysis, rather than at the beginning. Lastly, the Tribunal declined Canada’s proposal to offset the cost of replenishing livestock using withheld annuity money because the Crown was required under Treaty 6 to provide aid. In sum, the Beardy’s decision on compensation provided much needed judicial guidance and clarification on the nuanced and fact-driven assessment of equitable compensation, both in the Aboriginal law context and generally.